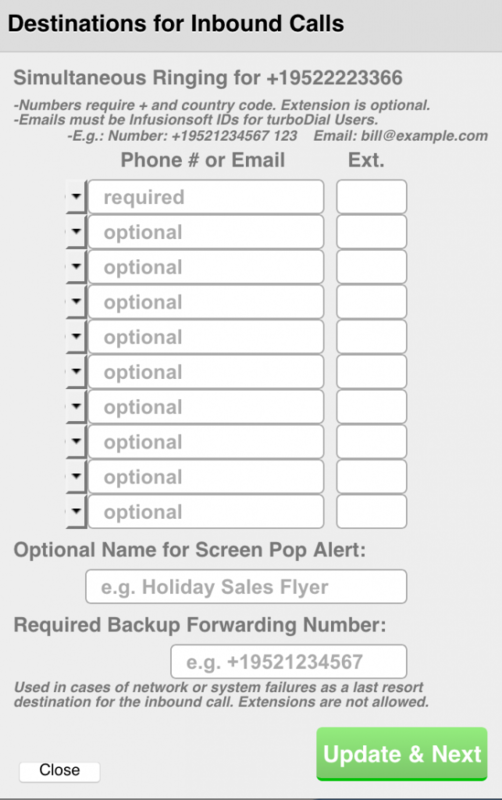 The Forward to Contact Owner feature allows you to choose the Infusionsoft Contact Owner as the configured destination for inbound calls. This feature is part of the Enhanced Inbound add-on and Hosted Voice upgrade in turboDial. The Contact Owner is the Infusionsoft User in your company who is designated on the Contact Record as the owner of that contact. See more here. When an Inbound Number is configured to include the Contact Owner as one of the destinations for inbound calls, turboDial will attempt to ring the phone and the softphone client for the User in your team who is designated as the owner of the Contact who is calling. If that User has a phone number in the Phone 1 field on their Infusionsoft User record then turboDial will ring that phone and the call can be answered with it. If that User is logged in to turboDial on their PC/Mac then they will see a screen pop alert for the call and can click the Answer button to accept it. 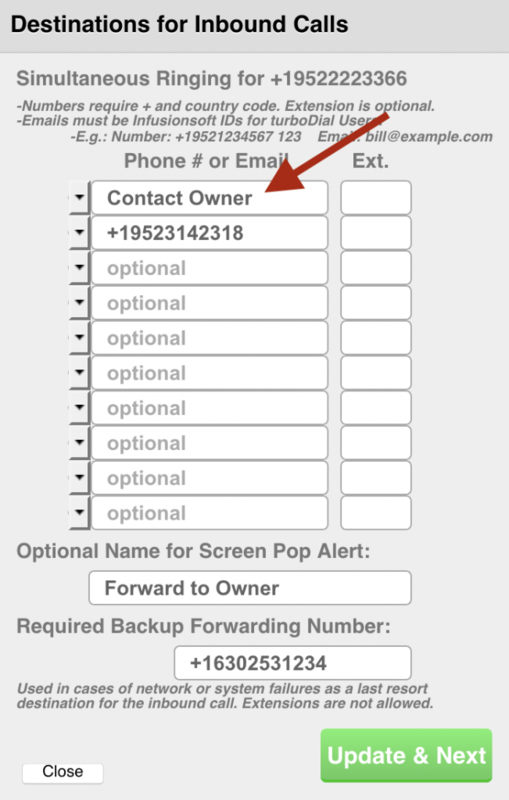 Search your Infusionsoft account for a Contact Record that has the caller’s phone number in a Phone field. If more than one Contact Record is found then the Contact with the lowest ID number will be chosen. If a Contact Record is found then turboDial looks for an assigned owner for that contact and obtains the Infusionsoft User ID of that owner. turboDial looks for a turboDial User in your account with that Infusionsoft User ID and obtains the email address they use to log in to turboDial and also obtains their phone number if it exists*. If the above steps 1-3 were successful then the turboDial softphone client for the Contact Owner will begin ringing for the inbound call, and if a phone number was available that phone will also begin ringing. If steps 1-3 did not succeed in finding the Contact, or did not find a turboDial User as Contact Owner, then the Inbound Number’s “Assigned User’s Infusionsoft Email ID” will be substituted as the softphone destination for the inbound call, and no phone number will be used. The Assigned User’s Infusionsoft Email ID can be found in the first configuration screen for an Inbound Number. Follow these steps to setup for Forward to Contact Owner. Now when you click the “Update” or “Update & Next” button your new configuration will be saved and inbound calls will ring at the turboDial softphone client for the Contact Owner. 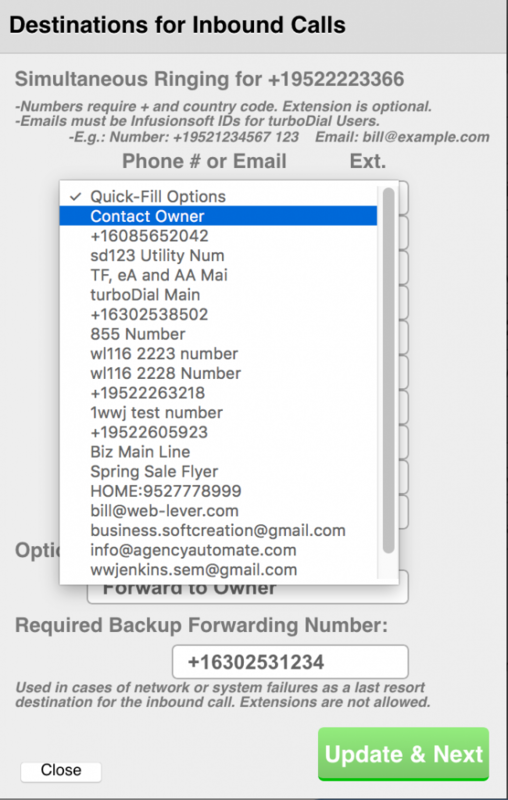 The Forward to Contact Owner feature will always send a call to a turboDial softphone destination, and will also ring a phone if a number is available for the Contact Owner. There are cases where turboDial will not succeed in finding a Contact Owner for an inbound call. Therefore you should always configure additional destinations for inbound calls so that calls will be assured of ringing to a phone or softphone even if a Contact Owner is not found. This feature is compatible with the Hosted Voice features that are accessible on the third configuration screen for the Inbound Number. You can configure Voice Mail, Auto-Attendant, Inbound Queueing or Find-Me for the Inbound Number that is set to Forward to Contact Owner. Infusionsoft servers can sometimes be slow to respond to turboDial’s requests for information, and sometimes the request fails with no response. During a slow response case your caller will be listening to a ringing phone for an unusually long time while turboDial attempts to extract information from Infusionsoft.